Hangovers are a distant, queazy memory, sleep schedules have readjusted and the post-New Year's slump is finally over. The first weekend of 2014 is packed to the gills! Hilt? Both! For starters, there's Arts Alive! Old Town, Eureka brings its own slew of musical and artistic options. Just to name a few: head to the Morris Graves Museum of Art (636 F St.) at 6 p.m. if you want some upbeat accordion rock from SqueezeBug, Shugafoot doles out some jazzy funk at Old Town Coffee & Chocolates (211 F St.) at 6:30 p.m. and the Americana duo The M-Notes throws down at Gallagher’s Irish Pub (139 Second St.) at 7 p.m.
After Arts Alive! you basically have a bazillion options for what to do next, give or take a few million. The night features two different comedy shows. 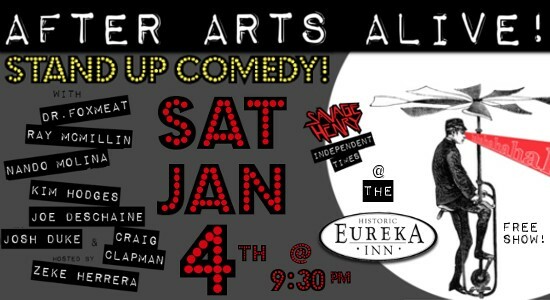 Savage Henry Presents is putting on a free show at The Eureka Inn's Palm Lounge (518 Seventh St.) at 9:30 p.m. Portland comic Ray McMillan headlines the Savage Henry Show, with hilarious local Zeke Herrera hosting. Other local comics will take the stage, including Joe Deschaine, Dr. Foxmeat, Josh Duke, Craig Klapman, Nando Molina and Kim Hodges. The Palm Lounge is classy, the humor maybe less so (here's hoping!) and it's free! If you're situated further north for the evening, then you can catch The PM Show with Juan Medina at Six Rivers Brewery (1300 Central Avenue) at 10 p.m. Juan Medina and Jesse Hett host a night of performances by Bay Area comedians Anthony Medina and Ron Chapman, local comics Tony Persico and Ivy Vasquez and Bay Area musician Josh Mcintosh. That is a lot of entertainment for $7. Not to mention the value of the memories. Comedy might not be your cup of tea and that's alright. There are other options. Sadly, Jan. 4 marks the end of an era for Nocturnum (206 W. Sixth St.). The nightclub is closing its doors for good and they're going out with gusto. DJ Razorburns will kick-off the Close Party and the night full of special guests and pop-up performances. The shindig starts at 9 p.m. and goes until there are no more shins to be dug, or until the bar closes down at 2 a.m. (which we all know is 1:30 a.m. in bar time). Head on over to The Hum to check out more musical options as well as Jennifer Savage's tete-a-tete with Lord Ellis' Steve Bohner. Humboldt, it's your Saturday; go nuts!